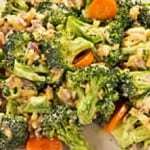 I have never had a problem getting my boys to eat their vegetables, but this Salad makes them love them even more! If you put a little bacon and cheese on your veggies, most kids will eat them. In a small skillet, fry the bacon until crisp, then remove on paper towels to drain the grease. 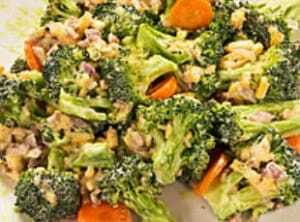 Place the broccoli pieces in a large serving bowl, add the shredded cheese, onion, carrots, and dressing and chill covered for 2 -3 hours. When chilled, crumbled the crispy bacon into bits and add to the broccoli, then add the sesame seeds and olives. I will definitely be trying this recipe. It looks delicious and so healthy too! My weekly Say G’Day Saturday Linky Party has just started and I would be honoured if you could join in and link up this fabulous post! Best wishes and I hope you have a great weekend! This would make a great lunch for a weekend afternoon, too.